This is post 2 of 2 today.. If you are looking for my JustRite preview, please scroll down or click HERE.. Thanks! 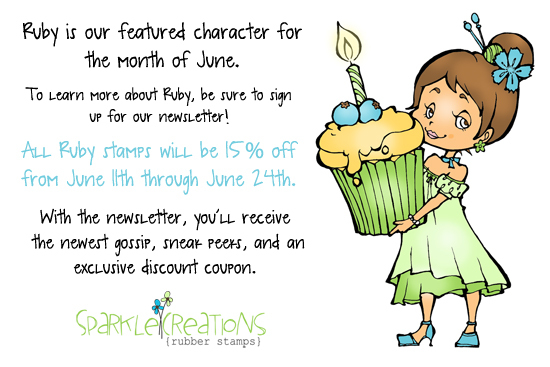 Hello and Welcome to the Day 2 of previews and the June release for Sparkle Creations Rubber Stamps! Sparkle is releasing 2 new SCRS images and 2 new Karber images -- they are all available in the store now.. Today we are previewing the first SCRS image, Cherry Blossom Rin and sentiment, "let us be grateful to those who make our souls blossom"! I didn't use the sentiment on my card as it didn't work for what I had originally planned. My card front is a Webster's Pages die cut that I really wanted to use. I didn't add too much since the die cut is already decorated and ornate. I popped my image panel of Rin, ruffled and stitched some ribbon and added a few black pearls (from Pizzazz Aplenty) on the left side. "Thank You" is from last year's Papertrey Ink anniversary set, Round & Round. Be sure to visit the rest of the SCRS designers for more peeks of Cherry Blossom Rin. Sparkle will be giving away a Cherry Blossom Rin to one lucky person! For a chance to win, you need to comment on all of the designer's blogs (list below). Then head on over to the SCRS blog and comment on the Rin post. You have until midnight EST each day to comment. The lucky winner will be announced the following day! Accessories: Long Rectangle Nestabilities (Spellbinders), Markers (Copic), Pearls (Pizzazz Aplenty), Seam binding, Foam tape, Thread, Sewing machine. Sooo pretty, love your shaped card! Beautiful papers, layout and adorable image! How cute is this, the colors are so soft and the black makes it pop. So Beautiful Steph. I love it. All the details is just amazing. Lovely card!. I like the flowers on the right. Beautiful!! OMG, this is STUNNING Steph! Your card has blown me away - beautiful! So cute Stephanie! That darling image coordinates with that beautiful patterned paper so well! What a beautiful card. Beautiful paper you used there. Find blog hopping fun. Can you get inspiration from other bloggers and see what wonderful creations they made of it. This is amazing!! What a wonderful card! Fabulous card and fabulous new image!! Rin is so Cute... Beautiful card! Very pretty Stephanie. Nice use of the die cut. so pretty! love the background paper you used and the unique shape. beautiful card, Stephanie! Super cute card. Love the shape. Oh Rin is adorable in your shaped card! :) Sparkle must be beaming from ear to ear! Beautiful design using the die cut. The image is sweet and lovely.